is with a family friend, at right. There are yellow ribbons tied around every pole in downtown Pageland, South Carolina, and American flags fly at half-staff. But the anguish the tiny community feels may be spelled out best in the banner that stretches across Main Street: "Thanks for everything. In memory of Jason Hicks." The 25-year-old Hicks was one of six U.S. airmen killed March 23, 2003, in a helicopter crash in Afghanistan. Family members and friends say Hicks, who was twice deployed to serve in Operation Enduring Freedom, most recently in January, died the same way he lived his abbreviated life: His HH-60 Pave Hawk helicopter went down during a thunderstorm while the crew was trying to pick up two children with life-threatening head injuries. "That was just typical Jason," said Eddie Rivers, chief of the Pageland Fire Department, where Hicks, like his father before him, was a volunteer firefighter. "He was always interested in helping someone else." At a rain-slickened grave site at Arlington National Cemetery yesterday, Staff Sgt. Jason C. Hicks was honored for helping an entire nation. As a clear plastic tarp was carefully removed from his flag-draped coffin, and those who loved him most huddled close in the springtime chill, an HH-60 Pave Hawk roared overhead in a final salute. "As we look around, we see that there are thousands of inscriptions and names that represent . . . the history of this great nation," Chaplain Mark Thomas said as rain tapped gently on the corrugated awning. "This afternoon we add another individual to the record of names who are identified as loving this country more than self. The cost of adding the name of Staff Sergeant Jason Hicks comes at a high price. 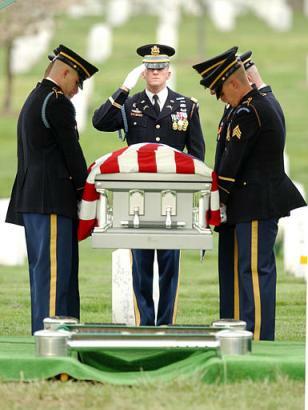 He gave all to ensure freedom for all." 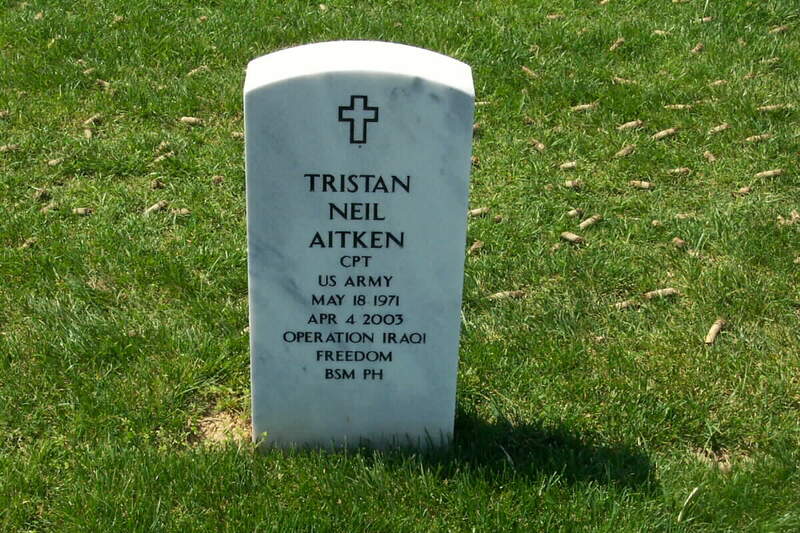 So, too, did Army Captain Tristan N. Aitken, 31, who also was buried at Arlington yesterday. Aitken, who grew up in State College, Pennsylvania, died in Iraq April 4, 2003, when he was hit with a round from a shoulder-mounted rocket launcher while riding in the lead vehicle of an artillery supply convoy. Aitken, assigned to the 41st Field Artillery Battalion, 3rd Infantry Division at Fort Stewart, Georgia, leaves behind a wife of 16 months, Margo. At Texas Christian University, he was a member of ROTC. Ronald Aitken told the Pittsburgh Post-Gazette that his son was a devout Christian who went to spring break in Fort Lauderdale while in college, not to party, but to preach on the beach to other students. "His faith sustained him," Ronald Aitken said. "It was his shield. . . . He was a rock." With U.S. forces defending freedom in Afghanistan and Iraq, for some at the cost of their lives, these have been busy days at the nation's preeminent military cemetery. At least five other service members who died in Iraq will be buried at Arlington this week, including today's service for Army First Lieutenant Jeffrey J. Kaylor, of Clifton. Kaylor, 24, a graduate of Centreville High School, was killed April 7 in a grenade attack about 20 miles outside Baghdad. He is survived by his wife Jenna, a Second Lieutenant in the Army. The two met as members of Virginia Tech's Corps of Cadets. Like Aitken, Kaylor was assigned to Fort Stewart, with the 39th Field Artillery. He was deployed to the Middle East last August; his wife was serving in Kuwait at the time of his death. Yesterday, Jenna Kaylor had this to say about her husband of 15 months: "Since the day Jeff entered my life, I have carried his soul with me everywhere. He is my strength, my love, my passion, my life. . . . The world is not complete without him -- I am not complete." The family has requested a private funeral. Jason and Crystalyn Hicks had planned a traditional wedding next month, when he got back from Afghanistan. But four days before he left in January, they decided not to wait and have a second service when he got back. Crystalyn planned to be with her husband on his next posting, to Japan, his sister, Janet Barbee, said yesterday. Hicks, who joined the Air Force in 1996 after graduating from high school and working for the Pageland Fire Department, discussed the upcoming church wedding in the last e-mail his sister received from him, on March 23, the day he died. Their mother, Taresa, had a bad feeling when Hicks was first sent to Afghanistan, last July, for three months, Barbee said. She didn't want him to go. But Hicks assured his family that if he did die, he would be doing what he loved most. "Nobody twisted my arm to do this," he told his sister. "Make sure they give me my flag." Yesterday, his wife and his mother were each presented with an American flag at his grave. ARLINGTON, Virginia -Army Capt. 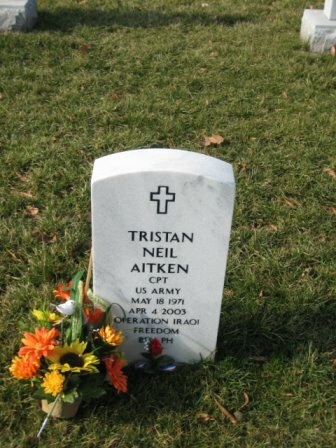 Tristan Aitken, who was killed in combat in Iraq on April 4, 2003, once said, "a true winner always gives his best, not to the glory of self, but to the glory of God." The State College native was buried Tuesday with full military honors at Arlington National Cemetery. The ceremony began with a salute to the fallen hero. His flag-draped casket was carried from a horse-drawn caisson to the gravesite by an eight-man honor guard. Following them were Aitken's wife of 15 months, Maria Forey-Aitken, his parents, Ronald and Ruth Aitken, and his sister Terryl. They took small steps, keeping time with the Army band, their pride as evident as their grief. Up to 100 other relatives and friends, including babies in their parents' arms, accompanied the Aitkens. "To be buried in Arlington, you have to earn it," said Army Chaplain Douglas Fenton, who presided over a 20-minute funeral service at the Fort Myer Chapel next to the cemetery. "Your character and your sacrifices pave the way. And so we honor Tristan for that." Tristan Aitken was deployed on January 24 with the 1st Battalion, 3rd Infantry Division, based in Fort Stewart, Georgia. He was killed when a rocket-propelled grenade struck his Humvee. Ron Aitken, Tristan's father, said his son, who was in charge of 217 soldiers, was riding in the lead vehicle in an artillery supply convoy when the attack occurred. "He always led his people," Ron Aitken said in an interview earlier this month. "He never waited in the back." Aitken, an Eagle Scout and a graduate of the Centre County Christian Academy, where he played soccer and basketball and ran track, comes from a military family. His father is a retired officer in the Navy Reserves, and his sister is an Army lieutenant. Aitken graduated in 1995 from Texas Christian University with a Distinguished Military Graduate medal. A devout Christian, he led the Officers Christian Fellowship at TCU. He has also served tours of duty in Korea and Kosovo, where he was responsible for supply inventory and assisted medical units. Aitken's sister broke down in tears during a short speech at the chapel funeral, and his aunt read a short poem about "America's Heroes." Fenton, striking a comparison with Aitken's mission in Iraq, reminded the congregation of about 60 people that Christ asked believers to "love thy neighbor." 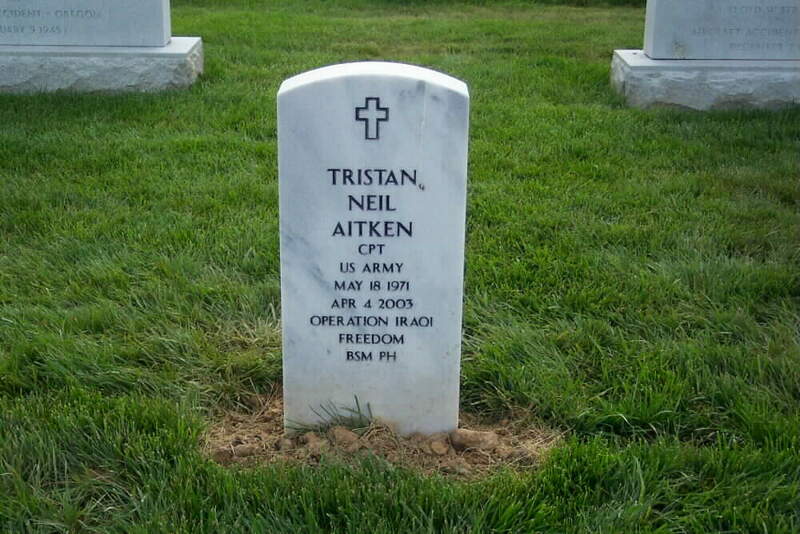 "Tristan served in Iraq, and you might ask, 'Is Iraq our neighbor?' I think Jesus would answer that there are no people on Earth that are not our neighbor, and I am confident that Tristan believed that in his soul," Fenton said. "To go to a faraway land, not just to serve the United States Army, but to also serve God and mankind." 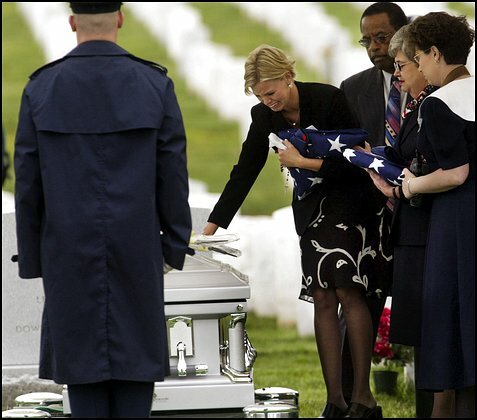 Aitken was the 10th casualty from the war in Iraq to be buried at Arlington. A spokeswoman said seven more were scheduled to be laid to rest there. Arlington has been home to America's departed war heroes since 1864, its austere white tombstones commemorating the dead from the American Revolution, the Civil War, Vietnam and the two World Wars. About 280,000 people have been interred within the cemetery's 624 acres, and about 25 funerals take place each day. At the grave, the honor guard held the Stars and Stripes over Aitken's casket as Fenton spoke reassuring words to the family. He spoke of Aitken's competitive nature, remarking that he had raced twice in a soapbox derby and then, later in life, changed to driving a military Humvee. Aitken "fought the good fight for his family, his country, and his God," Fenton said. The chaplain read from 1 Corinthians 9:24, a carefully chosen passage that echoed Aitken's own philosophy: "Don't you know that those who run in a race all run, but one receives the prize? Run like that, that you may win." As the sun disappeared into the gray clouds overhead, Fenton said a prayer. Then, the family stood while a rifle salute was fired -- three shots in quick succession, their abruptness a contrast to the gentle, familiar strains of taps, which followed on a bugle. The honor guard began to fold the flag, and as the Army band played "America the Beautiful" it started to rain. 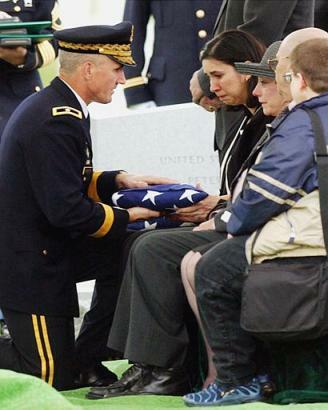 The meticulously folded flag was presented to Aitken's wife by a kneeling Brigadier General Mark T. Kimmitt. She was also given her husband's Purple Heart medal, awarded to soldiers wounded in battle, and a Bronze Star for meritorious service. Ruth Aitken also was presented with a flag and a Purple Heart. Once the ceremony was over, the family walked away from the gravesite, to be comforted by the other mourners. Family members declined to be interviewed for this story. 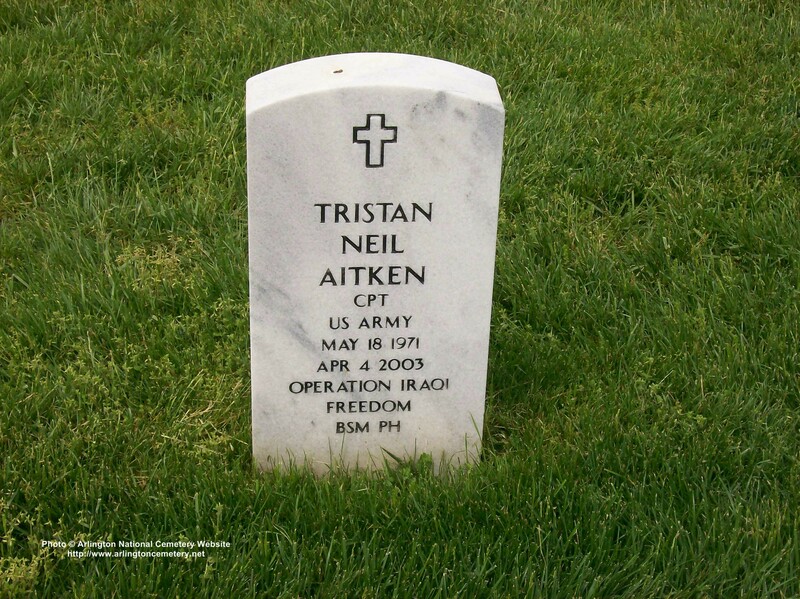 Ruth Aitken did not believe in the war in Iraq, but she believed deeply in her son, Army Captain Tristan N. Aitken. "I have made a decision, Tristan. I want to be an activist," she recalled telling him on the telephone last fall. "My question is, Do you have any problem with that?" "Mom, you're my Mom," said her son, who was killed Friday in the fighting at Baghdad International Airport. "You can be whatever you want to be, you know that." So the mother dismissed the war as an American power play for oil, wrote to local politicians in State College, Pennsylvania, where she lives, and cried when she watched the TV coverage. And the son prepared for the war for which he seemingly had always trained - roughing it outdoors as an Eagle Scout, snapping bullets into bull's-eyes as a state-champion marksman and mastering his classwork as the 1995 Distinguished Military Graduate from Texas Christian University. "Whenever he said something about freeing Iraqis, I would tell him what I thought, but I was also very proud of who he was, and I respected him for doing his job," Ruth Aitken said yesterday. "He was not really a fighter, you know. He joined the military because he genuinely wanted to make a contribution to society." Aitken, 31, died on Friday, 4 April 2003, as American troops swarmed the Baghdad airport, when a rocket-propelled grenade struck the vehicle in which he was riding. Among the other casualties announced yesterday was Army Sergeant Wilbert Davis, 40, Hinesville, Georgia, who was killed Thursday along with journalist Michael Kelly when their Humvee flipped and landed in a canal. The military also notified relatives of a Gulf War veteran, Army Sergeant Stevon Booker, 34, of Apollo, Pennsylvania, that he had been killed. Booker was a tank commander with the 3rd Infantry Division. Aitken is survived by his wife of 15 months, Margo; his parents, Ronald and Ruth; and his sister, Terry, who is in the ROTC at the Illinois College of Optometry. Although disturbed by the war that has taken her son, Ruth Aitken found comfort in recalling her family's happier times. In the 1980s, the Aitkens were the "A-Team" in national soap-box derby competitions. They wore black jackets and matching caps, and young Tristan took the controls of the motorless racer he and his father had built together. "I've often thought, that's where I really noticed his eye hand coordination that later must have helped him in the Army," Ruth Aitken said. As an Eagle Scout, Tristan Aitken was a member of the Order of the Arrow, Scouting's honor society. At TCU, he led the Officers Christian Fellowship. He had the privilege of training with Army Rangers as an undergraduate. His were deft hands with weapons, with vehicles, with global positioning devices, colleagues told his mother. One officer, Ruth Aitken recalled, told her that her son had "a third or fourth sense about things." In a letter dated March 6 that was received only recently by the family, Tristan Aitken asked his family not to worry about his welfare and to pray for the "safety and protection" of men and women under his command." "He cared so deeply about his soldiers and their families," Ruth Aitken said. "He would rather have taken that hit on Friday than any of the men and women he worked with. I know that. I just know that." Army Captain Tristan N. Aitken, 31, of State College, Pennsylvania, assigned to 1st Battalion, 41st Field Artillery, 3rd Infantry Division, Fort Stewart, Georgia, has been killed in action in Iraq. As a teen, Tristan Aitken raced twice in the national Soap Box Derby Championships. But the Army’s high-tech fighting machines became his professional passion. Aitken, 31, of State College, Pennsylvania, died April 4, 2003, in Iraq when a grenade struck his Humvee. “My kids are Republicans, and my wife and I are Democrats,” the father said. “We agreed to disagree about the war, but we support our kids 100 percent. Tristan’s sister, Terryl, is an Army Lieutenant. He is also survived by his wife, Margo, who is a teacher in Fort Stewart, Georgia. Robert Baylor, the principal at Centre County (Pennsylvania) Christian Academy, where Aitken attended high school, recalled Aitken and his pals playing war games with squirt guns during their senior class trip to Dollywood in Gatlinburg, Tennessee. at Arlington National Cemetery Tuesday, April 22, 2003.